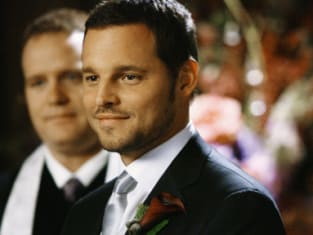 Alex Karev prepares to wed Izzie Stevens in "What a Difference a Day Makes," the 100th episode of Grey's Anatomy. He did so, and with flying colors. Alex and Izzie are husband and wife. Alex and Izzie embrace after getting married in the wedding of her dreams - which she originally planned for Meredith! Izzie Stevens in "What a Difference a Day Makes," the 100th episode of Grey's Anatomy. She is about to get married to Alex. Sniff. 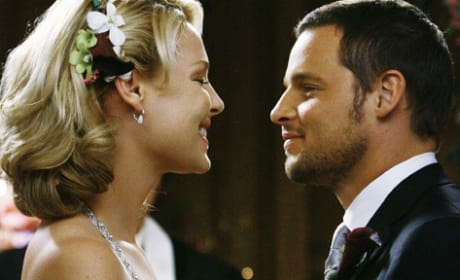 Alex Karev kisses new wife Izzie Stevens after an emotional exchange of vows and her dream wedding coming to fruition - even though she never intended to be the bride. Bet she's glad she is now! Alex and Izzie got married in "What a Difference a Day Makes," the 100th episode of Grey's Anatomy. It was a great scene and a great episode. That was the climactic scene of the 100th episode of Grey's Anatomy - the surprise nuptials of Alex and Izzie. Meredith and Derek were the ones supposedly getting married this day! Izzie and Alex kiss after exchanging vows in their emotional wedding. The whole gang was on hand to watch the two doctors get married. Alex and Izzie embrace after getting married in "What a Difference a Day Makes," the 100th episode of Grey's Anatomy, from Season Five. It was a great Grey's moment, no question about it. Alex and Izzie tie the knot on a very special Grey's Anatomy. They're all special, but this was one for the ages. Alex sweeps Izzie off his feet by reciting the wedding vows he made up after being inspired by a patient's planned valedictory speech. Truly touching. Alex wows Izzie with heartfelt wedding vows. Minister: Dearly beloved. We are gathered here today to celebrate the wedding of Alexander Michael Karev and Isobel Katherine Stevens. This is a sacred right. An ancient right. As Isobel and Alex prepare to join their lives, it is important to understand that everyone present has played a part in shaping their lives. And, will continue to play a vital role in their continuing future. And thus, we are here not only to witness their vows to each other, but to bestow upon them our blessing. And, now the couple will read their vows. Izzie: Oh, we didn't write anything. Alex: No, wait. I have something I wanna say. Today's the day my life begins. All my life I've been just me. Just a smart mouth kid. Today I become a man. Today I become a husband. Today I become accountable to someone other than myself. Today I become accountable to you. To our future. To all the possibilities that a marriage has to offer. Together, no matter what happens, I'll be ready. For anything. For everything. To take on life, to take on love. To take on possibility and responsibility. Today Izzie Stevens, our life together begins. And I for one can't wait. Minister: By the power vested in me, by god and the state of Washington, I now pronounce you husband and wife. Cristina: You slept here? I slept here! Callie: Um, how? Wait... who? What? Cristina: I slept in the on call room. Cristina: I could have been at home in my own bed. Cristina: Now I have to work all day, and then I have to be happy maid of honour and get Meredith down the aisle. I'm so tired, 'cause I slept here! 'Cause you wanted to get your freak on with roller skate girl. Cristina: Oh, you're picking up extra shifts in the ER? So is ah, is Owen not here today? Callie: Ah, he's here. Oh crap! I'm late. Hey. Cristina: BIG DAY! Biggest day of your life! Meredith: Don't do that! Don't do the peppy maid of honour thing, it's creepy! Cristina: Really? Good. Wait... is this like the calm before the storm? Do you need me to drug you? Or shave of your eyebrows to numb you into submission? Meredith: No! I'm fine. It's not the biggest day of my life. It's the biggest day of Izzie's life. I'm excited about the marriage, not some wedding. Anyway, she's the one that's gone all bridezilla.